It seemed only natural to nickname them the ‘Onslow Boys’. Every time they swaggered in the front door of the Onslow Hotel after a hard week’s work, their laughter was loud and genuine as they settled onto their bar stools. I peeked through the restaurant partition, a flimsy divider between my world and theirs. I couldn’t help but smile whenever I saw them, saw him ... Toby Morrison. Quiet seventeen-year-old Tess doesn’t relish the thought of a summertime job. She wants nothing more than to forget the past haunts of high school and have fun with her best friends before the dreaded Year Twelve begins. To Tess, summer is when everything happens: riding bikes down to the lake, watching the fireworks at the Onslow Show and water bomb fights at the sweltering Sunday markets. How did she let her friends talk her into working? After first-shift disasters, rude, wealthy tourists and a taunting ex-boyfriend, Tess is convinced nothing good can come of working her summer away. However, Tess finds unlikely allies in a group of locals dubbed ‘The Onslow Boys’, who are old enough to drive cars, drink beer and not worry about curfews. Tess’s summer of working expands her world with a series of first times with new friends, forbidden love and heartbreaking chaos. All with the one boy she has never been able to forget. It will be a summer she will always remember. Warning: sexual references, and occasional coarse language. Scoop it up on Amazon & add it to your shelf on Goodreads! Sean looked out over the lake, squinting against the sunlight. He turned to me, his expression sobering as his eyes flicked over my face in silent study. Three years on, a now nineteen-year-old Amy returns to Onslow for the summer. What once was a cauldron of activity with live bands, hot meals and cold beers, the Onslow Hotel now lies dark, deserted and depressing. All fond childhood memories of loitering on the hotel stairs and eavesdropping on customers’ colourful conversations are in the distant past. How had her dad let it come to this? With the new threat of putting the Onslow up for sale, Amy reluctantly turns to a local tradesman for help: Sean Murphy, the very same Onslow boy who saved her life all those years ago. With his help and that of some old friends, the task is clear: spend the summer building the hotel back up to its former glory or lose it for good. form of a smug, gorgeous Onslow boy. As the countdown to the new millennium begins, there is one thing everyone agrees on: no one wants to be in Onslow for New Year’s Eve. So that can only mean one thing: road trip! No longer the mousey, invisible, shy girl from years ago, Tammy Maskala is finally making up for all those lost summers. A new year with new friends, which astoundingly includes the bossy boy behind the bar, Chris Henderson. She likes her new friends (at least most of them), so why does she secretly feel so out of place? After chickening out on the trip, a last-minute change of heart sees Tammy racing to the Onslow Hotel, fearing she’s missed her chance for a ride. The last thing she expected to meet was a less-than-happy Onslow Boy leaning against his black panel van. Now the countdown begins to reach the others at Point Shank before the party is over and the new year has begun. Alone in a car with only the infuriating Chris Henderson, Tammy can’t help but feel this is a disastrous start to what could have been a great adventure. But when the awkward road trip takes an unexpected turn, Tammy soon discovers that the way her traitorous heart feels about Chris is the biggest disaster of all. Fogged up windows, moonlight swimming, bad karaoke and unearthed secrets; after this one summer nothing will ever be the same again. Coming Soon! Add it to your shelf on Goodreads! 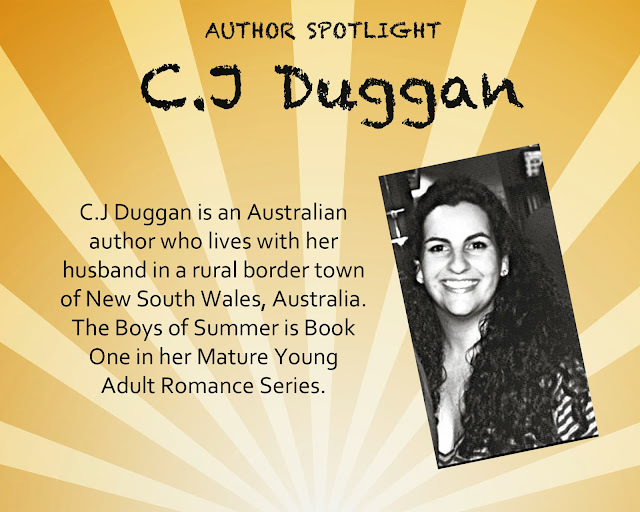 C.J Duggan is an Australian author who lives with her husband in a rural border town of New South Wales, Australia. The Boys of Summer is Book One in her Mature Young Adult Romance Series. *Not suitable for children. Please keep out of the reach of children. *Shipping from me within the United States will be Priority Mail, Insured, with Delivery Confirmation and tracking will be provided to the winner via e-mail; International Shipping will either be via First Class International or Priority Mail International. *Open to Residents of the US and Internationally. Winner will be notified by email. Winner will have 48 hours to respond before a new winner is selected. I will contact participating authors regarding your prize(s). The authors, in most cases, are shipping or e-mailing their items to you directly. I will make every effort to assist you in obtaining your prize. If there is an issue, please notify the author within 30 days for assistance. *The products offered for the giveaway are free of charge, no purchase necessary. Facebook, Twitter and Google+ are in no way associated with this giveaway. By providing your information in this form, you are providing your information to me and me alone. I do not share or sell information and will use any information only for the purpose of contacting the winner.